Commercial helicopters perform wide range of missions from emergency medical services to commercial air transport to the laying of power lines to navigation and surveillance. Commercial helicopters are categorized by their weight, cost, performance and dedicated mission. The capital expenditure incurred on the commercial helicopters has increased by 3.5% in 2017. Two largest aerospace manufacturers, Boing and Airbus revenue in 2016 was USD 94.57 billion and USD 71.00 billion in 2016 respectively. Commercial helicopter market leader Airbus in 2017 accounted for 260 commercial helicopters of the total 520 helicopters delivered globally, followed by Bell with 18% and Leonardo with 17% market share. Global commercial helicopter market is highly impacted by the foreign exchange rates, international business risks, sub-contractors, suppliers and representatives, Changes in government regulations or import and export policies, volatility in global economy or changes in political conditions worldwide has excessive impact on the global commercial helicopter market. Goldstein Research analyst forecast that the global commercial helicopter market size is set to reach USD 34.6 billion by 2025, growing at a CAGR of 2.6% over the forecast period. 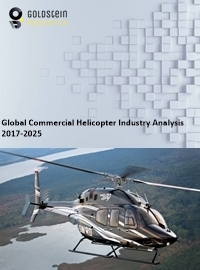 The technological research and developments, supply chain management between OEMs, equipment manufacturers and suppliers, the investors, the global political and economic condition, growth in aviation industry among others are some of the major factors impacting the growth of global commercial helicopter market. The report covers the present ground scenario and the future growth prospects of the commercial helicopter market for 2017-2025 along with the global sales and global revenue of the commercial helicopter. We calculated the market size and revenue share on the basis of revenue generated from major players across the globe. We have forecast the market on the basis of number of commercial helicopter orders executed, investments, OEM and component and subsystem manufacturers, service providers’ revenue, aviation industry market size and share. On the basis of product type, commercial helicopters accounted for 38.4% market share of the total global commercial helicopter market. The efficiency, roominess, endurance and comfort of medium helicopters provide them with wide and easy application in the crowded airport environments and other places. Medium-weight commercial helicopters are best suitable in oil and gas industry and commercial transportation among others. Heavy-weight helicopters segment grew at a rate of 2.1% annually, on account of its powerful engines and robust blades, ideal for fast cruise speeds, high payloads and long ranges. Commercial helicopter market outlook 2017-2025, has been prepared based on an in-depth market analysis from industry experts. The report covers the competitive landscape and current position of major players in the commercial helicopter market. The report also includes porter’s five force model, SWOT analysis, company profiling, business strategies of market players and their business models. Global commercial helicopter market report also recognizes value chain analysis to understand the cost differentiation to provide competitive advantage to the existing and new entry players. Commercial helicopters are being combined with data analytics technology within the helicopter engineering and manufacturing expertise is in trend, to bring about developments in application of commercial helicopters in oil and gas, search and rescue operations and VIP transport by major players such as Lockheed Martin has combined with Sikorsky for these developments. Commercial helicopters applications in different sectors such as oil and gas industry, healthcare industry and more are frequently raising their demands for support. The times of disaster or demand from corporate sector requires equipped and sophisticated avionics with specialized designs and safety features, which drives the growth of commercial helicopters. The global economic slowdown and political uncertainty are the major challenges faced by the global commercial helicopter market. Such as in Spain, political and economic downturn impacted aviation and tourism industry that slumped by 18% -20% revenues. Based on geography, Europe accounted for largest market share of 36.2% in 2017 of the total global commercial helicopters. The major manufacturers of helicopters are headquartered in Europe such as Airbus S.A.S. headquarters in France. Asia-Pacific commercial helicopter market is expected to grow at a faster rate of 1.9% annually over the forecast period. Asia-Pacific is been experiencing infrastructure development activities that requires application of commercial helicopters. Global commercial helicopter market report comprises of the following companies as the key players in the commercial helicopter market: Airbus S.A.S., Bell helicopter Textron Inc., Russian Helicopters, Lockheed Martin Corporation, Leonardo, The Boeing Company, Hindustan Aeronautics Limited, Korea Aerospace Industries, Ltd., Robinson Helicopter Company, Kaman Corporation, MD Helicopters, Inc.,. What is the revenue of commercial helicopter market in 2016-17 and what would be the expected demand over the forecasted period?